Transparency Market Research (TMR) has published a new report titled “Voice Prosthesis Devices Market - Global Industry Analysis, Size, Share, Growth, Trends, and Forecast, 2018–2026.” According to the report, the global voice prosthesis devices market was valued at US$ 130 Mn in 2017 and is projected to expand at a CAGR of 4.5% from 2018 to 2026. Head and neck cancer is the sixth most common type of cancer, and its incidence is growing. According to the American Society of Clinical Oncology (ASCO), head and neck cancer accounted for nearly 4% of all cancers in the U.S. in 2017. Moreover, nearly 65,000 individuals will develop head and neck cancer in the near future. In terms of the initial site of development, 44% of head and neck cancers involve the oral cavity, 31% the larynx, and 25% the pharynx. Demand for quality health care and patient safety has led to the development and introduction of new voice prosthesis devices. The report offers detailed segmentation of the global voice prosthesis devices market based on valve, device, and end-user. The market has also been segmented based on region (North America, Europe, Asia Pacific, Latin America, and Middle East & Africa). The indwelling voice prosthesis device segment is likely to drive the global market. Key players are tapping opportunities to introduce more advanced voice prosthesis devices with features such as long duration. Players are incorporating new coating material into the prosthesis as a material preservative. This feature may eliminate or reduce the need for anti-fungal agents such as nystatin and the frequent replacement problem. Cancer Statistics Review of the National Cancer Institute, an estimated 12,250 men and women are diagnosed with cancer of the larynx each year in the U.S.. In 2015, there were an estimated 99,756 people living with laryngeal cancer in the U.S.. The number of new laryngectomies has been declining, mainly because fewer people are smoking, and newer therapeutic approaches can spare the larynx. Little competition currently exists in the voice prosthesis devices market, leaving an area of considerable opportunity for interested newcomers. Currently, a few voice prosthesis devices are available in the voice prosthesis devices market. They include Provox Vega, Blom-Singer Dual Valve, Provox 2, Blom-Singer Classic. Recent additions to the market have highlighted that the voice prosthesis devices landscape is diversifying. Demand for quality health care and patient safety has led to the development and introduction of new voice prosthesis devices. However, there are new and promising alternative treatment lines in the pipeline such as more efficient and long duration voice prosthesis devices. In terms of revenue, the voice prosthesis devices market in Europe and Asia Pacific is projected to expand at a CAGR of 4.41% and 4.46%, respectively, during the forecast period. 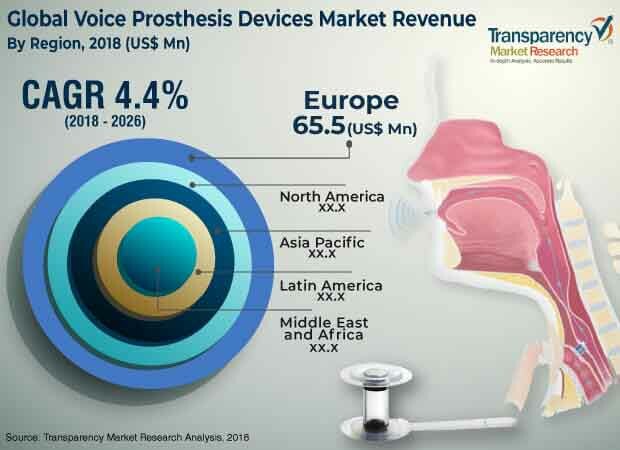 Rapidly increasing diagnosed patient population in the region and rise in treatment rates are expected to boost demand for voice prosthesis devices from 2018 to 2026. Expansion in the medtech industry and government initiatives in the region are anticipated to provide lucrative opportunities for manufacturers in the next few years. The incidence of tobacco-related head and neck cancer (HNC) is decreasing, but the incidence of cancer due to the human papillomavirus continues to increase. The report also provides profiles of leading players operating in the global voice prosthesis devices market. These include Atos Medical, InHealth Technologies, Smiths Medical, Servona GmbH, and Hood Laboratories. The trend of mergers & acquisitions, strategic collaborations, and new product launches are expected to drive the global market during the forecast period. In January 2018, Atos Medical strengthened its market position by acquiring Heimomed Heinze GmbH & Co. KG of Germany.